I made a rainbow salad for Ana tonight. Red peppers, grated carrot, corn cut from the cob, green beans, beets and eggplant. I was just having fun with Ana’s veggies and Ana made me laugh as she sang the rainbow song, red and yel-low, green, blue, purple… all through dinner. Whilst I was putting the salad together, it did get me thinking back to the “five a day the color way” campaign that ran from about 2002 until 2007. The campaign promoted the idea that different colored fruits and veggies contain different kinds of nutrients. 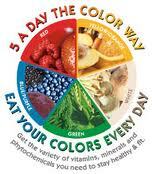 The greater the variety of colors in your diet, the greater the variety of nutrients. 5 a day the color way was a wellness campaign that began around 2002 and was discontinued around 2007. Red fruits and veggies often get their hue due to their lycopene content. Lycopene (in tomatoes, watermelon and guava) may reduce the risk of some types of cancer and has been beneficially linked to prostate cancer. Cranberries, strawberries and red grapes look red however, not because of lycopene but because of their anthcyanins content. Even though the science behind the campaign isn’t perfect I think the concept is still great. Sure, there’s lots we don’t know about the nutritional benefits of fruits and veggies and how their natural plant pigmentation plays into that but there is plenty we do know (or we’re at least pretty sure of). It’s fair to say that consuming a variety of fruits and vegetables from a variety of colors will give us a variety of vitamins, minerals and phytochemicals which is good for our health. Combining a range of colors in our veggie dishes is a pragmatic approach to assuring consumption of a range of nutrients. It also looks pretty and might just make your toddler sing as she eats her veggies! What colors have you had today? This entry was posted in food for kids, nutrition and tagged 5 a day the color way, benefits of fruits and vegetables, how to eat healthier, natural plant pigmentation, real food for kids, salad. Bookmark the permalink. Apart from the nutritional benefits – doesn’t the array of colours make the food look so tempting! We eat with our eyes. Totally!! I remember seeing some kind of “improve the way you eat” show, I can’t remember which one, and they put what this one family ate in a week out on their dining room table and it was all processed yellow. Buns, fries, pasta, chips, cheese, bread. It looked so… blah! White (milk), black (coffee), yellow (cheese), pink (ham), light (the pizza base), slightly darker brown (Just Right) – oh yes, some more yellow (pineapple) and green (chillie). Was this what you meant by a variety of colour? But I will have a better salad for dinner tonight – promise. This sounds so amazing, its like food for the eyes along with the food for your belly. I’m definitely making this sometime soon. Let me know how you go! Obviously you can use whatever veggies you want depending on what’s around. It would be nice with fruit at a party too. Watermelon, cantaloupe, pineapple, kiwi, pomegranate and blueberry and plums! 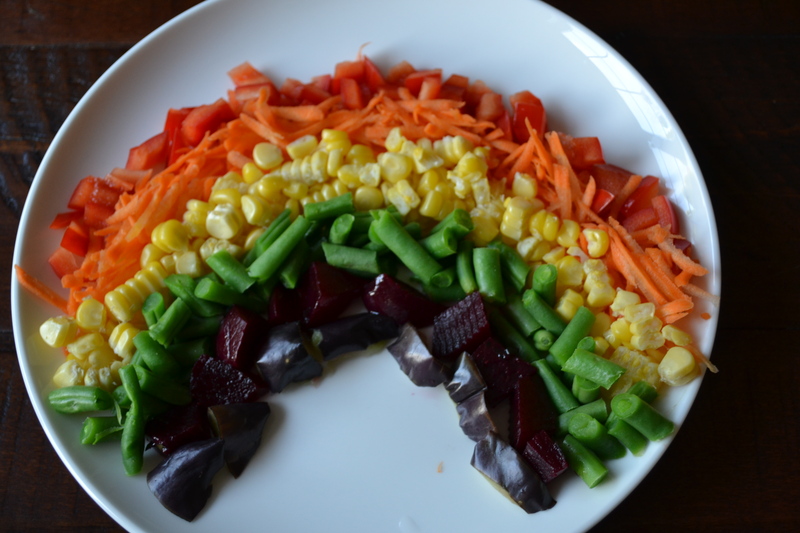 I love the Rainbow Salad – how gorgeous and what a fun way to get her to enjoy eating them! (Other than that she loves them). It’s good to mix it up. It was a very big serve for a two year old! I finished off what she left but it was a bit of dinner time fun with veggies. Wow, I love this! You are super creative. Thanks for the post! Sending this to my sis to make for my adorable nephews. Thank you! I hope your nephews enjoy it! That’s great! I don’t know if you saw some pictures I posted on December 31st of my daughter’s birthday party food? Colorful fruit platters at kids birthday’s always go down well. Have a great party!